Duikteam Heerenveen – Ademen als een vis? “Triton uses a new technology of artificial gill model. – It extracts oxygen under water through a filter in the form of fine threads with holes smaller than water molecules. – This is a technology developed by a Korean scientist that allows us to freely breathe under water for a long time. – Using a very small but powerful micro compressor, it compresses oxygen and stores the extracted oxygen in storage tank. – The micro compressor operates through micro battery. With the Triton Oxygen Respirator, it might be possible to breathe beneath the surface of the water as if you were a fish. 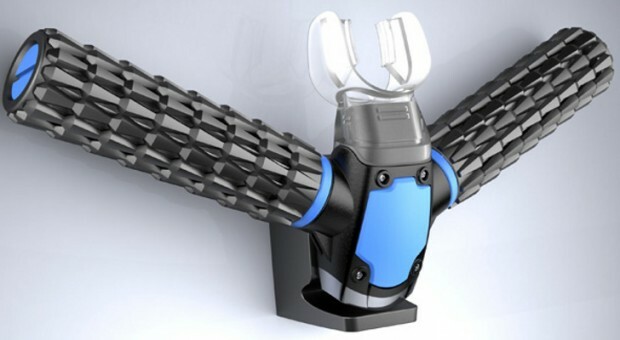 Requiring no bulky tank to keep your lungs pumping properly, this invention of scuba diving equipment is much more ergonomic and organic in design. The regulator comprises a plastic mouthpiece that requires you to simply bite down. There are two arms that branch out to the sides of the scuba mask that have been developed to function like the efficient gills of a marine creature. The scaly texture conceals small holes in the material where water is sucked into Jeabyun Yeon’s Triton. Chambers inside separate the oxygen and release the liquid so that you can breath comfortably in the ocean. Kom maar op met dat ding! Dat zou ideaal zijn! Duikteam Heerenveen de eerste club met deze techniek?